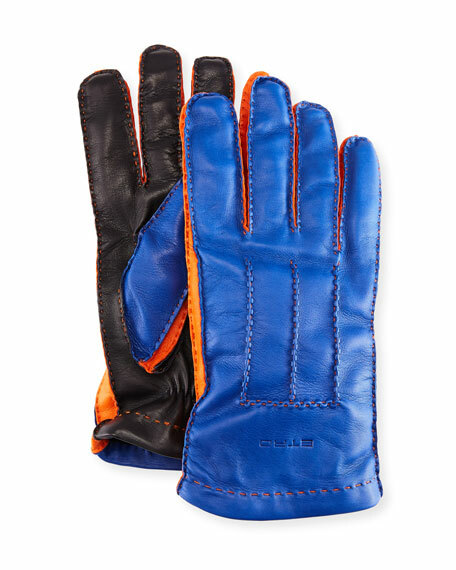 Etro men's gloves in colorblock lamb leather. To determine your glove size, measure the circumference of your hand around your knuckles, excluding your thumb. Then pick your glove size based on the measurements below. For the most comfortable fit, you may want to go up a size if you fall in between these numbers. For in-store inquiries, use sku #2315674. Guanti Giglio Fiorentino gloves in napa lambskin leather. Exposed thumb and forefinger for mobile device use. Three-point stitching on back of hand. Cashmere lining. Snap cuffs. Made in Italy. Portolano napa leather gloves. Three-point cords on top. Side vents at outer wrist. Cashmere lining. Imported. 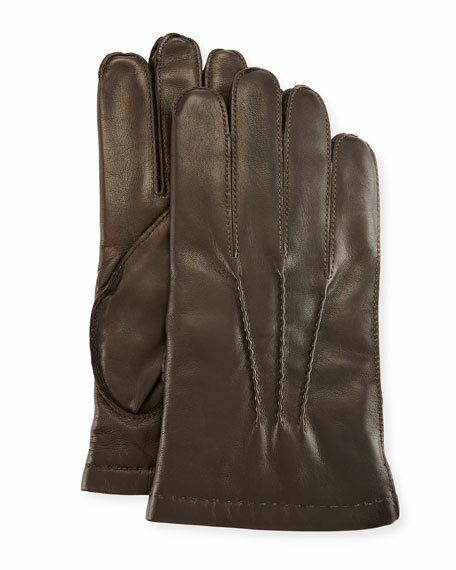 Neiman Marcus napa leather gloves. Approx. 2.2"L from base of wrist to hem (two-button length). Cashmere lined. Imported.